While there are many valid concerns with DTC PGT, particularly with respect to the quality and efficacy of the information these commoditised services offer, there are also real fears that over-regulation could stifle innovation and prevent consumers access to their own personal genetic data. This paper aims to show that despite the trepidation with DTC PGT, tighter regulation that limits individuals’ access to the information is not the answer. Instead, legislation should focus on the quality, reporting and purchase kamagra overnight delivery oversight of the information presented to the consumer, as well as addressing privacy concerns. Advances in technology have seen the cost of sequencing a human-sized genome drop from nearly $100 million in 2001 to under $5,000 in 2014. 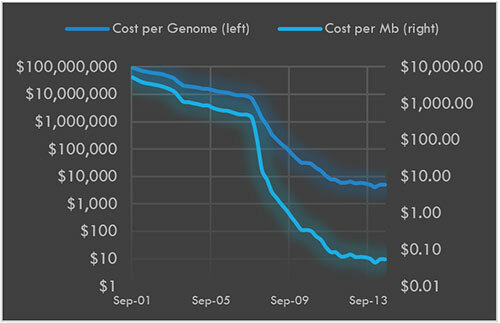 With the cost per megabase dropping to the 4-5 cent mark, it has become possible for companies such as 23andMe to offer genotyping services to consumers. A genome scan reveals information that is medical, genealogical and recreational. And those who scan and interpret the data are not distinct bodies of experts, but instead, novel configurations of geneticists, customers, ethicists, bioinformatics experts and buy diflucan new media executives. Much literature advocating regulation has focused on whether PGT constitutes medical diagnoses or a recreational hobby. Many of those advocating a more regulated approach believe that PGT has the potential to cause significant harm through the following key areas: test validity, consumer response and the effect on physicians and the wider health industry. In turn, the questionable validity of DTC tests has several facets: the statistical relevance of genome-wide association studies, consistency between services and the clinical utility of the tests themselves. Genome-wide association studies look at genetic markers across a set of subjects and try to identify correlations between DNA and any health risks, symptoms or traits. Importantly, GWA studies only identify a correlation not a causal link. In medical research, GWA studies are often a launch pad for more exhaustive research into the pertinent traits. Furthermore, expression of genes or particular health risks are often strongly influenced by external factors: lifestyle, age and education as well as epigenetic and environmental factors (Valles, 2012). However, many DTC services only use published reports based on GWA studies to predict results on a particular health trait. There is also no consistency with how they apply the non-genetic factors to these results before displaying the results to consumers. This has led to notable discrepancies in the reports generated by different service on the same DNA sample, and even differing results between the same DNA provided multiple times to the same service (Valles, 2012). Clinical utility in its narrowest sense refers to the ability of a screening or diagnostic test to prevent or ameliorate adverse health outcomes such as mortality, morbidity, or disability through the adoption of efficacious treatments conditioned on test results…Clinical utility can more broadly refer to any use of test results to inform clinical decision making. In short, detractors of DTC PGT question whether reports that target diseases such as multi-bacillary leprosy, a disease that is only prevalent in areas of significant poverty, provides any clinical utility to an affluent, Western consumer. Similarly, whether reporting a marginal, statistically-irrelevant increase in risk to a particular health trait should be noted at all. Other peripheral concerns centre around the psychological impact that test results could have on consumers. Will DTC PGT lead to hypochondria, hyper-parenting and over-diagnosis? Will all these issues put strain on an already stretched medical industry, taking away valuable physician’s time from genuine medical concerns? Firstly, we must state the obvious explicitly: DTC PGT services have a social and india cheap drugs viagra corporate responsibility to provide accurate, repeatable and medically-sound data to the consumers that buy their kits, regardless of whether they are purchased for medical, genealogical or purely recreational purposes. The use of tests based solely on limited GWA studies or highlighting statistically unsound increases or decreases in health risk is a dubious practice and is not to be condoned by proponents of PGT. However, advocating an increase in regulation due to a perceived lack of clinical utility or potential psychological ramifications is unsound. The democratisation of information is imperative in any liberal society and there is an unfortunate attitude in the academic medical profession that would seek to protect those deemed incapable of understanding genetic information presented to them without being first filtered through many layers of professional advice. There are many dangers in presenting data that may not be clinically valid and potentially psychologically damaging if not framed appropriately, as outlined above. However, taking the stance that normal consumers are entirely dependent on professionals to interpret their own results is elitist and comes with its own set of dangers. The two largest of these are blocking an individual’s access to their own genetic data and stifling innovation, specifically disruptive innovation, within the medical industry. The “right-to-know” argument purports that individuals have the unalienable right to know their own genetic data. Some detractors, such as Valles, believe that there is a fundamental difference between information and interpretation of the raw data and therefore take exception to this (Valles, 2012). However, many of these services are purely aggregating and highlighting other publicly available information to make it more easily digestible. Arguing that individuals should have access to the raw data that comprises their DNA (the 3 billion A, T, C and Gs), as long as it isn’t displayed in context of other publicly available information is counterintuitive. As long as the information that is displayed in context of the genetic code is academically and (where appropriate) medically sound, this information must fall within the “right-to-know” argument. The interactions [between business and government], in the form of regulations, professional standards, and administrative procedures, create opportunities for incumbents to support the status quo by erecting barriers to market entry. The typical firm bringing a disruptive innovation to market is unable to meet these established rules because it characteristically offers products or services with a narrower or more limited scope, a different business model, and potentially a different customer focus from that of incumbent firms. An unintended consequence of this system is an environment that supports sustaining innovation over disruptive innovation. Finally, addressing the concerns such as the psychological effects of PGT, a recent survey (Bloss, Schork and Topol, 2011) of 3,639 participants found no significant differences in the level of anxiety, dietary fat intake, or exercise behaviour and no clinically significant test-related distress. The report also found no increase in health screening after testing, dismissing the notion that PGT would put a financial burden on an existing healthcare system. While these call into question the efficacy and clinical utility of the tests themselves, it does not provide ammunition for regulating DTC PGT any further. PGT holds significant value to consumers and has the potential to disrupt more traditional healthcare with personalised and preventative information. However, it is also evident there are areas within this blossoming industry that require additional scrutiny, particularly around data quality and consumer privacy. We have adjusted the criteria we use for selecting and reporting genetic variants to our customers. 23andMe has chosen to focus on individual genetic markers with well-established associations that have clinical relevance. This decision was made after consulting with a number of the most respected stakeholders in the scientific community. 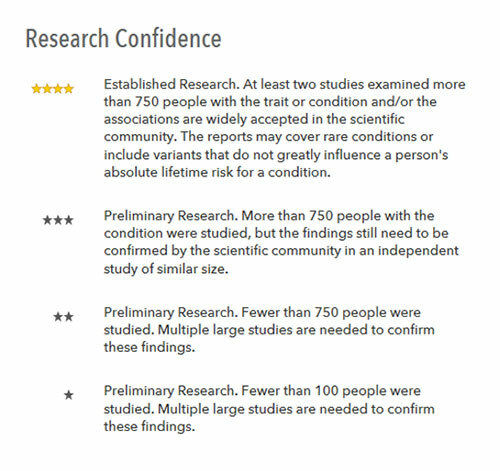 As such, all health risk, drug response and inherited condition reports are currently (as of April 2015) rated a 4-star confidence. Other non-medical traits (such as memory, male pattern baldness and lactose intolerance) range from two to four stars. This, combined a regular disclaimer that reports are not for diagnostic use, starts to educate the consumer on the applicability and scope of the results presented to them. While the confidence in the reports is clearly indicated, more could be done to improve consumer understanding of the science and statistics behind the reports – specifically around GWA studies and the correlative vs. causal link (or lack thereof) of the supporting data. Increasing consumer awareness, via supporting documentation or genetic counselling, should become a mandatory part of any health risk reporting within DTC tests. The US has commercial services that provide such counselling and the UK NHS has 33 Genetic Centres across the country (British Society for Genetic Medicine, 2015). This could be achieved via a regulating body that oversees consumer advocacy in this regard – similar to the Financial Conduct Authority and the UK banking industry. Protecting consumers’ genetic privacy is also incredibly important to safeguard. There are several important considerations: the use of “anonymised” data in genetic-wide association studies, a right-to-forget to allow for removal from genetic databases and the use of genetic data by commercial organisations such as insurance companies. As PGT companies have grown, they have quickly moved to monetise the huge quantity of valuable genetic information they hold by granting researchers, pharmaceutical and other third-parties access to the aggregated data. Most services allow consumers to opt-out of being part of this research, although there is no legal impetus to do so. Somewhat worryingly, DTC PGT companies are already ahead of the curve in giving users the option to opt-in and out, as current legislation (particularly in countries with significant genetic research such as the United States, United Kingdom and Iceland) allow for scientists and researchers to use, publish and disseminate genetic data without participants’ explicit consent (Kulynych and Greely, 2014; Royal College of Physicians, 2011; Anderson, 1998; Rose, 2001). Anonymous: ‘Biological materials that were originally collected without identifiers and are impossible to link with their sources’. Anonymized: ‘Biological materials that were originally identified, but have been irreversibly stripped of all identifiers and are impossible to link to their sources’. Identifiable: ‘Biological materials that are unidentified for research purposes, but can be linked to their sources through the use of a code. Decoding can only be done by the investigator or another member of the research team’. It is evident that the first category of “anonymous” could never be applied to DTC PGT data and the second category is technically difficult to achieve. All DTC PGT data would readily fall into the last two categories, and should be treated with respective due diligence. Furthermore, genetic information is reasonably unique in that inferences can be made beyond the individual it pertains to. Hereditary information can give insights into mothers, fathers, siblings and children – all of whom may or may not have given their explicit consent. For example, a Joint Committee on Medical Genetics report undertaken by the Royal College of Physicians and the Royal College of Pathologists noted that the access to medical records of decreased patients is governed by the Access to Health Records Act 1990 (as opposed to the Data Protection Act), potentially granting a “close” (such as a familial spouse, rather than genetically close) relative access to information that may be pertinent to other blood relatives (Royal College of Physicians, 2011). In the UK, regulating for informed consent and data protection is already heavily protected by the Human Tissue Act 2004, the Data Protection Act 1998, the Mental Capacity Act 2005 and the European Convention on Human Rights, Article 8 (RCP, 2011). However the current legislation focuses on clinical use of genetic data and the subsequent use of this information in research – inferring there is a medical reason behind the initial genetic tests. The advent of DTC PGT has caused this genetic data to increase exponentially and it is important that consumers that may have ordered a PGT for recreational purposes are aware that their DNA may be being used for medical research. To this end, there are several precedents when looking at the privacy afforded genetic data particularly around the storage and subsequent application of it. This sets an interesting precedent, as currently the storage of criminal DNA is regulated and protected with recourse for individuals to request data be deleted while consumer DNA held under DTC services is not. While the parallels between a criminal database (where DNA data is intrinsically linked in an individual) and the reuse of consumer DNA for research does not entirely overlap, it signals a public interest in the movement away from implied consent and indefinite storage of genetic data. This attitude was further reinforced by the retracting of the controversial Clause 152 in the Coroners and Justice Act 2009. The clause would have allowed the Data Protection Act to have been overruled, allowing sensitive data held by the government, individuals or private companies (including genetic data) to be requested for “any public policy purpose”. The plans were abandoned in March 2009 before the Act was passed (Booth, 2009; Coroners and Justice Act 2009). Strengthening DTC services’ “opt-in/opt-out” strategy for research with a more robust “right to be forgotten” would ensure consumers have more control over the proliferation of their genetic data – de-identified or otherwise. This should include a mandatory requirement for clear clauses in the terms of services and privacy policies outlining what opting out of research participation or cancelling entailed such as the “cooling off” period and whether your genetic data would be removed from existing de-identified databases. In a similar vein, one mature area of genetic privacy governs the use of individuals’ data within the insurance market. Specifically, the Genetic Information Non-Discrimination Act in the United States and the United Kingdom Concordat and Moratorium on Genetics and Insurance. The Genetic Information Non-Discrimination Act 2008 (GINA) builds upon the anti-discrimination laws already present within HIPAA by banning the use of (or requesting of) genetic information of individuals or their families in the calculation of underwriting for individual or group health insurance purposes (United States Department of Labor, n.d.). Within the United Kingdom, no official law has passed but the Government and Association of British Insurers have agreed a long-standing moratorium, currently in place until 2019, on the use of genetic test (both predictive and diagnostic). Unlike GINA, the moratorium extends beyond health insurance to life insurance and has one exception – the disclosure of Huntington’s Disease for life insurance covered over £500,000 (Concordat and Moratorium on Genetics and Insurance, 2014). While the US is taking more of a blanket approach, ensuring that any change to attitudes using genetic data in insurance would have to be specifically legislated to allow, the UK approach is aimed at striking the right balance as the technology moves faster than legislation can keep abreast of. While out of scope of this paper, there is a wider discussion of whether genetic information should be used within the insurance market. If the goal of DTC PGT is to provide consumers access to more personalised medicine, why does that not extend to other markets such as insurance? Existing insurance relies on spreading unknown risk across a large number of individuals, but a more personalised variant of insurance could lower premiums for the vast majority of people. Both GINA and the UK moratorium target the mandatory requiring of genetic testing in underwriting, but an optional path may exist for “healthy” consumers who wish to lower their premium. Similarly, specialised insurance providers may arise to cover particular high-risk use cases. However, the option must always be there for consumers to insure without undue discrimination or disclosing their genetic data. While there are policies in place that govern niche uses of genetic data, such as those used in criminal databases or surrounding their use within insurance underwriting, the broader application of current law to DTC PGT is a fluid topic. Products used in direct-to-consumer testing services providing health-related information are regulated as in vitro diagnostic medical devices and are subject to European Union legislation that sets out minimum standards of safety and quality. The testing service itself is not subject to this legislation, only the products…Furthermore, under existing EU legislation, testing services are regulated in the country where the test is being performed. The tests offered by 23andMe are performed in laboratories that are based in the United States of America and as such are covered by US legislation. One would interpret the MHRA’s position to therefore mean that if the Food and Drug Administration (FDA) approved the testing service, the MHRA would be happy with the product on the UK marketplace. The reality is considerably more convoluted. In November 2013, the FDA sent 23andMe a warning letter to stop marketing health risk information to consumers (FDA 2013). This led to the immediate cessation of health risk reports in the US market for new customers although the genealogical information remained intact. In June 2014, 23andMe formally submitted a 510(k) premarketing submission to the FDA for a health report pertaining to Bloom Syndrome. This submission was subsequently converted to a de novo request – the process used when there is no market equivalent with which to compare the product – with the FDA granted approval in mid-February 2015. It is thought that with this initial de novo approval being granted for the Bloom Syndrome report, 23andMe can apply for subsequent 510(k) authorisations moving forward (Wojcicki , 2013; Hibbs, 2014; Wojcicki, 2015; 23andMe, 2015; FDA, 2015). Effectively, after many years of posturing, the FDA has decided that it must regulate individual health reports served by DTC providers with 23andMe’s Bloom report paving the way through the de novo process to allow other reports and additional vendors to follow suit. It is hard not to point out the irony that proponents of increased regulation argued that DTC PGT currently only provided “low value” reports for diseases of little threat or relevance are now finding that their desired regulation is being prototyped on an extremely rare autosomal recessive disorder. While the clinical utility of such a test is high in certain diagnostic scenarios, it does little to help the more utilitarian nature of personal genomic testing itself and as such continues to undermine the genuine disruptive nature of this innovative technology. In summary, it is important that access to direct-to-consumer personal genomic testing is not hampered by misguided attempts at protecting consumers’ rights or underestimating their ability to understand, absorb and react to the information presented to them – whether it is health risk data, or more benign genealogical or trait information. However, a liberal approach to access to genetic reports should be conducted upon a medically and academically sound foundation. Furthermore, ensuring that consumers have access to all the information they require regarding their genetic data and the privacy principles that govern them, as well as additional resources such as genetic counselling should be made as clear as possible. Current policies that govern medical research, data privacy, data retention and the use of genetic data are all currently in force in various countries globally, however there is little consistency governing how consumer genetic data is to be protected. Indeed, some existing legislation (such as the UK Access to Health Records Act) could lend itself to privacy complications when dealing with genetic information. In the UK, new legislation should be introduced that grants consumers the right to be forgotten as well as a regulating body that provides consumer advocacy and oversees the quality of the documentation and consumer communication – in much the same way the Financial Conduct Authority governs the banking industry. In the US, with the FDA’s new expanded remit over DTC PGTs and the advent of a de novo authorisation, there is hope that the heavy-handed tactics will not continue, but instead the rigour and insight garnered from regulating 23andMe will pave the way for an increase in the health reports available to American consumers. The benefits to the consumer to utilise and leverage their own genetic information are staggering and could pave the way for whole new industries in personalised medicine, insurance, genealogy, pharmacology and areas we cannot even envision now. As with any emerging technology, it is imperative we balance genuine privacy concerns and corporate responsibility with the flexibility to allow disruptive innovation to change our world. 23andMe. (2015) “What the FDA Decision Means for 23andMe Customers”. 23andMe Blog. Retrieved 13th April, 2015 from http://blog.23andme.com/news/what-the-fda-decision-means-for-23andme-customers/. Anderson, Rose. (1998) “The DeCODE Proposal for an Icelandic Health Database”. Retrieved 11th April, 2015 from http://www.cl.cam.ac.uk/~rja14/Papers/iceland.pdf. Booth, Phil. (2009) “The Coroners and Justice Bill: Clause 152”. StateWatch. Retrieved 12th April, 2015 from http://www.statewatch.org/news/2009/feb/uk-ml-convention-clause-152-briefing.pdf. British Society for Genetic Medicine (2015). “Genetic Centres”. Retrieved 11th April, 2015 from http://www.bsgm.org.uk/information-education/genetics-centres/. Concordat and Moratorium on Genetics and Insurance: 2014 (2014). Department of Health. Retrieved 12th April, 2015 from https://www.gov.uk/government/publications/agreement-extended-on-predictive-genetic-tests-and-insurance. Coroners and Justice Act 2009. (n.d.) Retrieved 12th April, 2015 from http://www.legislation.gov.uk/ukpga/2009/25/pdfs/ukpga_20090025_en.pdf. Daily Hansard: 20 May 2013. (2013). Retrieved 14th April, 2015 from http://www.publications.parliament.uk/pa/ld201314/ldhansrd/text/130520-wms0001.htm#wms_st_4. Food and Drug Administration. (2013). “23andMe, Inc. 11/22/13”. Retrieved 13th April, 2015 from http://www.fda.gov/ICECI/EnforcementActions/WarningLetters/2013/ucm376296.htm. Food and Drug Administration. (2015) “FDA permits marketing of first direct-to-consumer genetic carrier test for Bloom syndrome”. FDA. Retrieved 13th April, 2015 from http://www.fda.gov/NewsEvents/Newsroom/PressAnnouncements/UCM435003. Godard, B. A.; Schmidtke, J. R.; Cassiman, J. J.; Aymé, S. G. N. (2003). “Data storage and DNA banking for biomedical research: Informed consent, confidentiality, quality issues, ownership, return of benefits. A professional perspective”. European Journal of Human Genetics 11: S88–122. Hibbs, Kathy. (2014) “Update on the Regulatory Review Process with the FDA”. 23andMe Blog. Retrieved 13th April, 2015 from http://blog.23andme.com/news/update-on-the-regulatory-review-process-with-the-fda/. Howe, Earl. (2014). “Medicines and Healthcare Products Regulatory Agency:Written question – HL3347”. Retrieved 13th April, 2015 from http://www.parliament.uk/business/publications/written-questions-answers-statements/written-question/Lords/2014-12-02/HL3347. Kiss, Jemima. (2014). “23andM admits FDA order ‘significantly slowed up’ new customers”. The Guardian. Retrieved 9th April, 2015 from http://www.theguardian.com/technology/2014/mar/09/google-23andme-anne-wojcicki-genetics-healthcare-dna. Kulynych, Jennifer J.; Greely, Hank. (2014) “Every Patient a Subject: When personalized medicine, genomic research, and privacy collide”. Slate. Retrieved 10th April, 2015 from http://www.slate.com/articles/technology/future_tense/2014/12/when_personalized_medicine_genomic_research_and_privacy_collide.single.html. Prainsack, Barbara; Reardon, Jenny. (2008) “Misdirected precaution”. Nature. 2008 Nov 6, 456(7218):34-5. Protection of Freedoms Act. (2012) legislation.gov.uk Retrieved 12th April, 2015 from http://www.legislation.gov.uk/ukpga/2012/9/pdfs/ukpga_20120009_en.pdf. Rose, Hillary. (2011) “The Commodification of Bioinformation: The Icelandic Health Sector Database”. The Wellcome Trust, London. Royal College of Physicians, Royal College of Pathologists and British Society for Human Genetics. (2011) “Consent and confidentiality in clinical genetic practice: guidance on genetic testing and sharing genetic information”, 2nd edn. Report of the Joint Committee on Medical Genetics. London: RCP, RCPath, 2011. Schulman, Kevin A.; Vidal, Ana Valverde; Ackerly, D. Clay. (2009) “Personalized medicine and disruptive innovation: Implications for technology assessment”. Genetics in Medicine 11(8): 577-81. FAQs on the Genetic Information Non-discrimination Act. (n.d.) United States Department of Labor. Retrieved 12th April, 2015 from http://www.dol.gov/ebsa/faqs/faq-GINA.html. Valles, Sean A. (2012) “Should Direct-to-Consumer Personalized Genomic Medicine Remain Unregulated? : A Rebuttal of the Defenses”. Perspectives in Biologs and Medicine 55(2): 250–65. Wojcicki, Anne. (2013) “23andMe Provides An Update Regarding FDA’s Review”. 23andMe Blog. Retrieved 13th April, 2015 from http://blog.23andme.com/news/23andme-provides-an-update-regarding-fdas-review/. Wojcicki, Anne. (2014) “A Note to Our Customers Regarding the FDA”. 23andMe Blog. Retrieved 13th April, 2015 from http://blog.23andme.com/news/a-note-to-our-customers-regarding-the-fda/. While there are numerous direct-to-consumer PGT companies, this paper focuses on 23andMe as it is currently the largest and the only provider licensed to operate in both the United States and United Kingdom.